Brett Sloan has 10 years of coaching experience and will be entering his second season with the Longhorns. Before arriving at Kell Coach Sloan spent 2 years at George Walton Comprehensive High School in Marietta, GA. At Walton he coached quarterbacks and served as the Co-Offensive Coordinator. Prior to moving to Walton Coach Sloan spent 3 years at James F. Byrnes High School in Duncan, SC. At Byrnes he coached wide receivers for 2 years, quarterbacks for 1 year, was the co-offensive coordinator for 1 year, and the offensive coordinator for 1 year. Prior to that, he spent 5 years at Chapman High School in Inman, SC. At Chapman he coached wide receivers for 2 years, quarterbacks for 3 years and was the passing game coordinator. Brett is a native of Inman, SC. He graduated from Chapman High School in 2002, where he played football, basketball, and baseball. After graduation Brett attended Newberry college for a year, later graduating with honors from the University of South Carolina Upstate with a B.A. in Spanish. Brett is married to Brittany Sloan. Brittany is an honors graduate of Clemson University and currently serves as a Staff Accountant at Strickland & Company, PC in Marietta, GA. Brett and Brittany have one small dog, Pebbles, and are expecting their first child, Tristan William, in September 2017. 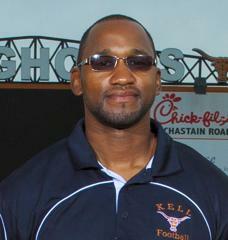 Coach Gates is entering his third year at Kell High School as the Assistant Head Coach/Offensive Coordinator. He also takes care of the recruiting and academics for the Longhorn program. The 2016 Longhorns made it to the Final 4 in the state playoffs and averaged 31.4 ppg throughout the entire season. During the 14 game campaign, Coach Gates’ offensive line gave up only 5.5 sacks total on the year. He came to us in 2016 from North Cobb High School. There he served as the Run-game Coordinator and Offensive Line Coach, where the Warriors made the state playoffs 5 years consecutively, averaging 33ppg during the 5 years with a Final 4 appearance in 2012. Coach Gates also served as the Academic Advisor for the North Cobb football program. 2017 brought another state playoff appearance for the Longhorns as they averaged over 30 points a game. Coach Gates came to Cobb in 1987 where he played at McEachern High School and went on to play football at the University of Georgia where he had the opportunity to block for NFL greats like Terrell Davis and Garrison Hearst. Steve lives in Cobb County and has two children, Connor(18), who attends Berry College and plays football and Cooper(14), who is a freshman at Kell and plays tennis. Coach Szatkowski is entering his third year, as the Defensive Coordinator, at Kell High School, and 15th year overall as a football coach. He is extremely excited to be a part of the Kell football family. He had previously been a defensive coordinator for nine seasons at Heritage High School, East Paulding High, and Villa Rica High. Coach Szatkowski played and coached football at Ferris State University, where he garnered academic all-conference recognition in 2002 and 2003. He has a master’s degree from the University of West Alabama, in Physical Education. Coach Szatkowski has been married for 11 years to the amazing and beautiful, Sarah Szatkowski. Together they have two boys, John (4) and Peter (2). ric Miller enters his second season at Kell as the Wide Receivers coach. He was a part of staff that scored 375 points on offense and average over 34 PPG (2nd all time). Before coming to Kell, Miller coached one season with the Tucker Tigers in 2016. This was his second stint with the team and was his 4th year total. Coach Miller helped them get back to the state championship game for the third time since 2011. He worked with the Wide Receivers, serving as passing game coordinator and directing the Special Teams. Typically a heavy run team, Miller and the Tigers were able to produce the first 1,000 receiver in the team’s storied history. All-State wideout, Joshua Vann, finished the season with 63 catches for over 1,200 yards and 13 Touchdown in 2016. Before returning to Tucker HS, Coach Miller spent two season coaching on the Division I level, coaching on both sides of the ball for FCS and Big South member, Presbyterian College. Miller played wide receiver at Princeton and Georgia State before graduating from LaGrange College in 2008 with a bachelor’s degree in business management. The Blue Hose assistant joined LaGrange while returning home to help his family and helped the Panthers to a conference championship and its first and only playoff berth. Coach Daykin was born in Taipei, Taiwan and grew up in Augusta, Ga. He attended Georgia Tech and graduated in 1977 as a Dean’s List student with a degree in Industrial Engineering. Tony played linebacker and strong safety and was elected team captain in 1976.He was drafted by the Detroit Lions in 1977 and played there in 1977 and 1978 and then played from 1979 - 1982 for the Atlanta Falcons. He has been married to Kathy, a graduate of UGA, since 1982. They have two children, Kevin, who graduated from UGA in 2010, and Haley, who graduated from KSU in 2015. This is his eighth year as a math teacher and coach at Kell. Coach Horne enters the 2018 season as a fourth year Longhorn varsity coach. He will be coaching the Corners and will be the Special Teams Coordinator. Coach Horne comes to Kell from Marietta High School where he spent one year as the Blue Devils Corners Coach and Co-Special Teams Coordinator. Prior to Marietta, Coach Horne spent 10 years as the Co-Defensive Coordinator, Special Teams Coordinator, and Linebackers Coach at The Westminster Schools in Atlanta, during which time the Wildcats made the playoffs 8 of 10 years, winning in the first round of the playoffs all 8 years. Prior to his tenure at Westminster, Coach Horne was a Graduate Assistant Strength and Conditioning Coach at The University of Tennessee.With over a decade of coaching experience, he possesses a vast knowledge of defenses including, multiple over and under 4-3 fronts, a 3-4 defense, and a 3-3 stack. Coach Horne is the Head Strength and Conditioning Coach at Kell and has developed athletes in the weight room for over 16 years at the high school and college level, using an Olympic-based background to enhance explosive strength and speed. Coach Horne will be the Head JV Lacrosse Coach for the 2016-17 school year. He coached track and field at Westminster, leading the team to 2008 and 2013 Boys State Championship and 2013 Girls State Championship titles. Coach Horne played football at the University of Tennessee from 1995-1998 as a Defensive Back, and contributed to the 1998 National Championship, and back-to-back 1997 and 1998 SEC Championships. Kevin played high school football at Berkmar High School in Gwinnett County, and grew up in Tucker, Georgia. Coach Horne is married to Katie Horne (formerly Katie Norman) of Marietta, GA. Katie graduated from the University of Georgia and Walton High School, and currently serves in the Corporate Talent department of Chick-fil-A, Inc. Kevin and Katie have a 6 year-old son named Benton and 2 year old daughter named Banks. Randy Warren has over 14 years of experience with professional, collegiate and high school sports teams. He came to Kell HS five years ago through Children’s Healthcare of Atlanta’s Sports Medicine Outreach program. Over the last 6 years he has worked for CHOA Sports Medicine program. Before working for CHOA, he spent six years at Florida Atlantic University (FAU), where he was the Head Athletic Trainer for four of those years. As Head Athletic Trainer, he was responsible for the operation of FAU’s sports medicine program, supervising and coordinating medical coverage for 450 student athletes.Randy has been a NATABOC Certified Athletic Trainer for 12 years and NSCA Certified Strength and Conditioning Specialist for 10 years. Randy holds a Master of Education in Sports Medicine from Old Dominion University and a Bachelor of Arts in Sports and Exercise Science from the University of North Carolina at Chapel Hill. Randy specializes in sports-specific strength and conditioning and injury rehabilitation. In addition to caring for student athletes at Kell HS, he also works part-time as a personal trainer at Fitness Together, helping clients reach their wellness, fitness, and life goals. Coach Cook is entering his fifth year at Kell working with our kickers and punters. He is excited about getting back to his roots as a high school and college kicker in developing talented kicking specialist who have gone on to achieve All State status in Georgia the past two seasons. Coach Cook grew up in Griffin, Georgia where he played his high school football. He continued his college football career at Mississippi State University where he earned a degree in Business Management. Coach Cook is a Territory Sales Manager for Encompass Insurance and currently resides in Kennesaw with his wife Nicole. The Cook’s have two children, Conner and Madison. Conner is a 2016 Kell High School graduate and is about to enter his junior year at Mississippi State University. Madison will be entering her sophomore year at Kell this year. Coach Todd Utt graduated from Morgantown High School, in Morgantown, West Virginia. While attending Morgantown High School he played football. He was a Second-team All State Offensive Lineman and was selected to play in the West Virginia/Maryland Coaches All-Star Classic. He then attended Fairmont State University and was a three-year letterman on the offensive line for the Fighting Falcons. While at Fairmont State, Coach Utt earned his Bachelor of Arts Degree in Health and Physical Education and is also certified in Special Education. After leaving Fairmont State, he played 6 years of semi-professional football with the Georgia X-treme. He was a four-time recipient of Offensive Lineman of the Year and was selected to the league’s All-star Team each season he played. Todd Utt started his teaching career at North Cobb High School in 1999 where he spent seven years coaching a variety of sports which included football, wrestling, track, and soccer. He then spent three years at South Cobb High School where he coached football and wrestling. This is Coach Utt’s tenth season at Kell, along with coach Gates he will be coaching the Varsity offensive line this season. He is also the Girls Varsity Lacrosse Coach. Coach Utt has been awarded Cobb County’s Girls Lacrosse Coach of the Year twice, leading the Lady Longhorns to an overall record of 97-30. The Team reached the second-round of the playoffs in 2012 and 2013 and finished the 2014 and 2015 season as back to back 5A State Champions. In 2016 and 2017 they were state runner-ups. Coach Utt is very blessed to be married to his wife Dawn and they have four daughters. Lauren (27), Morgan (24), Madison (17) and Morgan (13). Spencer Smith is a former 2005 Cobb County Defensive Back of the Year, and MVP of the year at Kell High School. He was a Safety and Four Year Letter Winner at the University of Hawaii, who appeared in 45 games, four Bowl games, including the 2007 Sugar Bowl and the 2010 New Era Bowl in Japan. He is a recipient of the 2008 Special Teams Player of the Year and the 2009 Defensive Player of the Year at the University of Hawaii. Spencer is currently the Founder and President of Triple H Tackle Academy. Where he identified a need for specialized coaching in the tackle area, in order to improve performance, efficiency, effectiveness, understanding and perhaps above all of this, safety. His tackle methods have been endorsed by NFL Players and Coaches. Coach Goddard is a 1984 graduate of Calhoun High School in Calhoun, GA. Coach Goddard attended and played football at the University of Georgia. Coach Goddard played football from 1984 til 1987, lettering in 1987. Over Coach Goddard’s 29 year career, he has coached at Port Charlotte High School, Cedar Shoals High School, Wheeler High School, Cass High School, Walton High School, East Paulding High School as the head coach & Lassiter High School before coming to Kell High School. In his 1st season at East Paulding High School, the Raiders went undefeated during the regular season and won their second region championship in school history. During his three year tenure at East Paulding the Raiders went to the second round of the playoffs 2 out of the 3 years that he was the head coach. As the head coach at East Paulding, Coach Goddard had a 23 – 11 overall record. While at Lassiter, Coach Goddard was the head lacrosse coach. During his two years as being the head coach, the Trojans won the state championship in 2017 & were state runner-ups during the 2018 season. Coach Goddard was recognized as the Cobb County Lacrosse coach of the year in 2017. Coach Goddard is married to Kathy Davis of Greenville, SC and he has two children, Caroline a junior at the University of Georgia and Chad a senior on both the football and lacrosse team. Justin Saxon has been coaching CrossFit athletes since 2011. He has previously coached at The Garage and Warrior Pride Fitness. He was also instrumental in founding CrossFit Marietta in January of 2012. He later branched out to launch CrossFit North Cobb in September of 2012. He comes to Kell High School having over 10 years of experience in the strength and conditioning field. Justin graduated with his Master's of Applied Exercise and Health Science from Kennesaw State University in addition to his Bachelor of Health Science from Armstrong Atlantic State University in Savannah, GA. In addition to being a CrossFit Level 2 Coach, Justin has also obtained his Certified Strength and Conditioning Specialist (CSCS) Certification from the National Strength and Conditioning Association, along with USAW-L1 (weightlifting), CrossFit Endurance, and ACE Fitness Nutrition Specialist. Justin is the owner of CrossFit North Cobb, Head Coach, and in charge of programming for the gym. “I look forward to working with Coach Horne and Coach Sloan as we rebuild the Kell Football program from inside the weight room and watch it pour over onto the football field." ©2019 Kell Longhorns Football / SportsEngine. All Rights Reserved.